As GM shutters a plant, an Ohio city in decline struggles to imagine a future. Despite the candy tossed out to children lining the curbs, the annual Labor Day parade in Mansfield, Ohio, last September was a melancholy observance. Pride of place went to United Auto Workers Local 549, its days sadly numbered, but much of the parade bore scant relation to labor. Fez-wearing Shriners zoomed around in tiny yellow cars, the high school marching band shuffled along indifferently and a Jesus impersonator stood astride a float for “Ohio’s only life-size wax museum,” the Living Bible Museum Bible Walk. The Steelworkers mounted a float advocating the Employee Free Choice Act, the Richland County AFL-CIO Central Labor Council endorsed universal health reform and the Teamsters, postal workers and building trades all turned out despite gloomy skies. But UAW Local 549–hammered by news that Mansfield’s giant General Motors stamping plant, once the city’s largest employer, will shut down in 2010–did not rise to the desperate occasion with some defiant final gesture. Not one autoworker even marched. Instead, Local 549’s leaders drove the parade route in twelve vehicles bearing a GM dealer’s logo, as if obliged to hawk the products of the very firm whose management has sounded their local’s death knell. At the very tail end of this cavalcade, almost unnoticed, came a spark of independent working-class creativity. Two men bore between them a large sign reading “Lest We Forget.” Against its black background were listed the manufacturers that have exited Mansfield in recent decades, among them Dominion Electric (1971), Mansfield Tire and Rubber (1978), Hoover Plastics (1980), National Seating (1985), Tappan Stoves (1986), Westinghouse (1990), Ohio Brass (1990), Wickes Lumber (1997), Crane Plumbing (2003), Neer Manufacturing (2007) and Smurfit-Stone Container (2009). Fraley worked at Ohio Brass for twenty-nine years until that firm, a Mansfield mainstay dating back to the nineteenth century, shut its doors. Afterward he held a string of factory jobs in Cleveland, Galion and Wooster, compelled to move along each time because of downsizings or closings. The “Lest We Forget” sign was his tribute to north central Ohioans who have given their lives to companies only to see them abandon the region. A Middletown for the twenty-first century, Mansfield is a microcosm of America idled. Equidistant between Cleveland and Columbus, it has a core population of 49,346, with 128,852 in its metro area. The city’s official unemployment rate is 12.1 percent, well above state and national averages–and if the chronically discouraged are considered, the rate is nearly one in five. Mansfield’s fabled origins date back to pioneer days, when it was named for a surveyor appointed by Thomas Jefferson. On ground that is now its town square, blockhouses were built to fend off Indian attacks in the War of 1812. As the seat of Richland County, whose name testifies to the area’s early agricultural bounty, Mansfield developed industrially when flour mills arose after railroads arrived in the 1830s. British and German immigration in the nineteenth century, supplemented by white Appalachian and Southern African-American migration in the twentieth, provided a ready workforce. That seems another world now. In the current recession alone, the city has lost Con-Way Freight, Value City, Circuit City and Cord Camera, not to mention restaurants like Ruby Tuesday. A multiplier effect of plummeting property values, declining tax revenues and failing small businesses is kicking in. 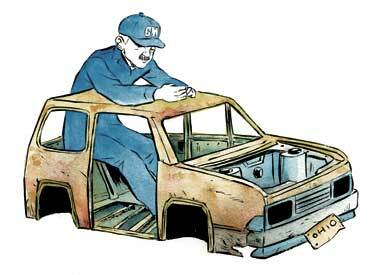 The loss of General Motors threatens a further chain reaction as small suppliers are hit. “You go out and search all the time for work, and there’s nothing around here,” says Ron Hacker, 45. “Even if anyone is hiring, it’s very low-wage.” Hacker lost his Teamsters job at Smurfit-Stone, a maker of corrugated boxes for Anheuser-Busch, when its Mansfield plant was closed in May, leaving eighty-three jobless. His wife, Jinny, had already lost her supervisory job at Gap in 2007, when the retailer eliminated its Richland Mall store. Now the Hackers work three part-time jobs between them, have exhausted their 401(k)s and are struggling with Wells Fargo to retain their home. As recently as five years ago, GM’s Mansfield-Ontario Metal Center was operating at full-tilt boogie. The state-of-the-art presses at the 2.9 million-square-foot plant pounded away “like a train moving at full speed,” in the words of Charles Bias, stamping out car doors, roofs, hoods, dashes and countless other large panels and parts. Following in the footsteps of his father, who worked there thirty years, Bias started at the plant in 2000 in production, working his way up to the skilled trades. “I was working all the overtime I could stand, and some I couldn’t,” he says. Today the company that once could not get enough of Bias’s labor finds no use for him at all. He was told to clean out his tools at Christmas 2008 in a layoff of several hundred. Last summer, 574 took buyouts. The remaining skeleton crew of about 420 will be transferred somewhere else in GM’s dwindling archipelago once Mansfield’s plant falls silent on January 29. At one time it would have been impossible for GM to shutter its Mansfield plant. Built in 1955, the big-box facility was soon making components for 90 percent of all GM cars, coast to coast. A citadel of hillbilly proletarian militancy, the plant erupted repeatedly in strikes. The largest, a 1967 wildcat, exploded when managers suspended two crane operators for refusing to load stamping dies at a shipping dock. Believing the company was moving the dies to avoid paying the overtime required to test them in Mansfield, practically the entire membership of Local 549–2,652 workers–walked out, bringing GM production nationwide to a screeching halt. The New York Times observed that the wildcat “nearly paralyzed the world’s largest industrial corporation” and “embarrassed one of the nation’s biggest labor unions.” UAW president Walter Reuther promptly seized the rebel local, and GM began diversifying its stamping operations. For a time, Mansfield’s GM plant actually added workers, peaking at 4,800 in the 1980s, a decade when the plant was thoroughly modernized. Up to just a few years ago, the company was still installing brand-new presses on the shop floor. But when oil prices spiked in 2008, consumers shunned GM’s gas-guzzling SUVs. Credit, so critical to auto sales, dried up in the financial crisis. Reeling, GM closed assembly plants, including one in Moraine, Ohio. That sealed the fate of Mansfield’s once-vital operations. GM’s highest-capacity stamping plant in North America became a stand-alone outlier, its shipping costs prohibitive. As GM, hemorrhaging cash, threw off its qualms about government intrusion to obtain a $49 billion bailout, its survival plan targeted Mansfield for excision. With careful planning, a tour of Mansfield could be arranged that would bypass its hard times. Begin a half-hour’s drive south at Mohican State Forest, with its picturesque sandstone bluffs. Proceed along winding roads to Malabar Farm, the estate of novelist Louis Bromfield, where Humphrey Bogart wed Lauren Bacall in 1945. Continue north to the upscale suburb of Lexington, past the multimillion-dollar YMCA fitness center, to Woodland, a historic Mansfield neighborhood with grand brick manor houses. Tend west to the art center, pause on Marion Avenue to see the boyhood home of Senator Sherrod Brown, head out to the placid Clear Fork Reservoir, and wend your way north by way of suburban Ontario’s affluent subdivisions to the Ohio State University’s wooded regional campus and the Westbrook Country Club. This verdant amble provides a sense of why Mansfield was the pastoral idyll of John Chapman, the mythic Johnny Appleseed, when he lived here from 1820 to 1840. Very different conclusions suggest themselves, however, if you begin on the east side, amid the modest homes of Madison township, a working-class suburb. Head into Mansfield, past the junkyard and water treatment plant. Follow the railway tracks north, and towering over it all you will see the abandoned seven-story Westinghouse factory, the city’s largest employer between the 1920s and 1970s. Once 8,500 employees worked here in sixteen buildings on forty-two acres, turning out stoves and refrigerators. During World War II the plant made aircraft radio transmitters, wings and bomb parts. Now the factory is barren, its windows pockmarked by thrown stones, the immense W on its water tower faded. From Westinghouse in all directions, particularly out to the largely black North End, stretch “the flats,” lowlands crowded with skinny houses planted a few feet apart. Once erected in a booming factory town, they are now dilapidated eyesores, attracting slumlords who never bother with repairs, their porches bowed, their siding weatherbeaten, their paint peeling. Many are boarded over. Mansfield’s median household income, $30,176, is far below the national median of $41,994. In the city schools, the poverty rate among children–defined by the Census Bureau as a four-person household with income under $22,025–is a staggering 28.8 percent. In part, this is the old story of racial disparity in America; Mansfield is almost 20 percent black. It is also the familiar story of the deterioration of urban schools with the flight of upper-middle-class whites, with their tax dollars, to the suburbs, since Richland County as a whole is nearly 10 percent black. But every school district in the county has seen its poverty rate rise in the past ten years, and a number have double-digit rates, including Madison (16.4 percent), Crestview (17.1 percent) and Plymouth-Shiloh (23.2 percent). Mansfield’s initial factory closings in the 1970s and ’80s were partially counterbalanced by the expanding GM plant, but as GM leaves, few other employers offer a comparable living. Out near the regional airport and state prison, newer industrial parks exist in auto parts and other forms of manufacturing, but the firms are nonunion. Rumors abound that the cavernous GM plant will be bought up by Hyundai or some other company, but given the industry’s overcapacity, there are few takers for the many such facilities on the market. Even should the plant be sold, its new occupier will almost surely be nonunion. Jay Goyal, scion of a local metal manufacturing family, is a young Democratic state legislator who represents Richland County, usually a Republican district. He holds innovation and education to be key to the area’s revival, looking to a wind farm rising near Shelby and prospects for bioproducts (plant-derived plastic equivalents). The question is whether such industries, if they do materialize, will yield high-paying jobs. Tim Bowersock, Mansfield’s economic development director, points to StarTek as a success story. A firm that handles outsourced customer care and technical support, StarTek opened a call center in Mansfield in 2008 that now employs more than 900 workers. But StarTek’s customer service representatives start at $9 an hour, many of them part time. Unionization of StarTek, Wal-Mart and the rest of the retail and service sector might bring living wages, but Speelman’s vision of a labor fightback must be squared with Mansfield’s quiescence. Richland County’s only self-declaredly “revolutionary” mobilizations are occasional red-white-and-blue tea parties to denounce “socialism.” A more reality-based form of resistance did occur in June, when foreclosure justice activists organized homeowners and labor union members to hit the downtown Mansfield branch of JPMorgan Chase, protesting its foreclosures by tossing little plastic sharks around the lobby. Every four years swarms of New Yorker and Washington Post journalists blanket Ohio, searching for Joe the Plumber. They file reports that Ohio workers are irredeemably conservative and racist, incapable of voting for, say, Barack Obama (as Ohio did). Few such writers are likely to turn up when Mansfield’s fifty-five-year-old GM plant stamps its last part on January 29. If they did, they might detect other story lines about Ohio’s working class: the shattering of the link between hard work and economic security, the price working people are paying for the collapse and restructuring of corporate America, and the perversity of an economy that no longer seems to value making anything other than exchange-traded funds and credit-default swaps. Christopher PhelpsChristopher Phelps is associate professor of American studies at the University of Nottingham in England. He is the co-author of Radicals in America: The U.S. Left since the Second World War (Cambridge).